Welcome to the Jungle, where the money is green and the free spin bonuses are plentiful in Guns N' Roses Slot. If you want similar visuals to play casino slots online games, visit our homepage. 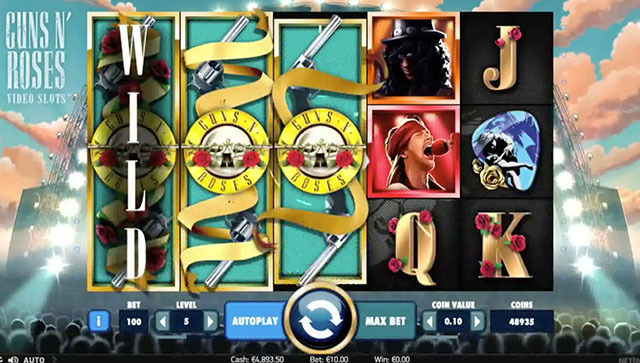 30 years after ‘Appetite for Destruction’ the ‘roses have been immortalised in this online slot game. Choose from a number of songs to soundtrack your playing and take advantage of the random multipliers and modifiers in this 5 reel bonanza! Produced by the legends and market leaders over at NetEnt, you can see their full range when you play online slots games. 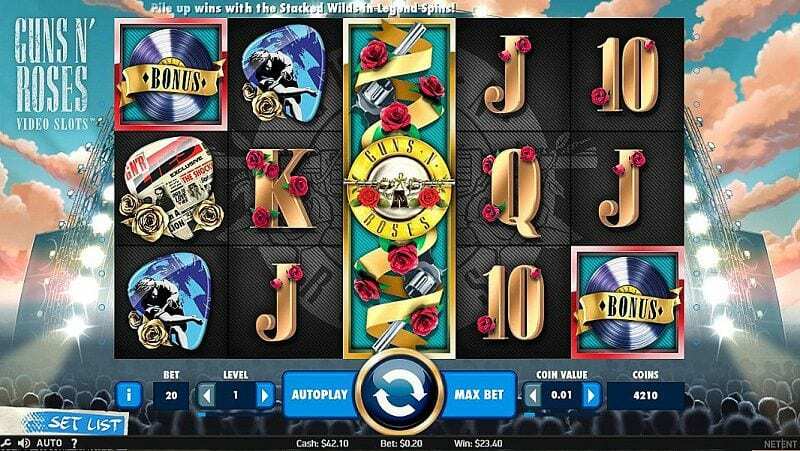 If you’re a fan of the band and you like the music then you will love this game, but even if you’re not a rocker usually, it’s still worth checking out the Guns N’ Roses slot game. So dust off your air-guitar, mullet and denim and give it a try! This is a Net Entertainment game and staying with the music analogy NetEnt certainly are a supergroup when it comes to games developers. They’ve been around a long time and have a history of churning out games with fluidity and playability. Guns N' Roses Slot is up to their usual high standards there's no doubt about that. The way their games are structured means that you can be well rewarded and they have a habit of convincing you to stick around and play for longer. One of the unique features of this game is the immense video animation of the band that is used in the opening sequence. You have the option to skip this part but even if you’re not a fan you’ll be tempted to leave it on for a bit of headbanging! Play the best slot games today! The slot mechanics themselves are actually fairly straightforward, it’s a typical 5 reel slot with a 20 payline structure. The appearance is fairly simple and easy to navigate which lends itself to great playability. The backdrop is the stage and the symbols being the band members, the most famous of which are Axl and Slash. There are also a number of other band related items which act as the symbols. The soundtrack is, of course, one of Guns n’ Roses most famous tunes “Welcome to the Jungle”! As usual, NetEnt provides a good range of betting options to accommodate most types of player and for this game, you can bet from £0.20 up to a whacking £200 so the game will suit big and small scale gamers alike. The game has some excellent bonus features which will be activated when you land certain combinations of symbols. The wild symbol is the famous Guns n’ Roses logo and this appears on all reels and replaces most other symbols. It can lead to a much-increased set of winning combinations. The other symbol to look out for is the bonus record symbol which can appear on reels one, three and five, and can trigger the main feature which is the bonus wheel. This has a lot of attractive benefits for the player. By spinning the bonus wheel you can win free spins, coins, and multipliers for your win. There is also a “legend spins” feature which appears at random points during the gameplay. This again awards free spins of a varying quantity. This game also has quite a rare feature which is a second wild symbol. This is the “Appetite for Destruction” symbol (a huge cross with the band members displayed on it). This gives you yet more chance of winning. This is a dazzling and modern slot game. It will instantly appeal to the rockers out there but it will also grow on the more conservative among you! The broad range of content and somewhat unique bonus features have meant that when the game first launched a couple of years ago it was an instant number 1 hit! If you’re ready to be taken down to Paradise City then this game is the one for you. It will leave you wanting to come back more and more. If you're a rock fan and you liked this one, well why not try our Jimi Hendrix slot?